Castle Post-Mortem: Boss Weighs in on Beckett’s Decision. Plus, Will There Be a Wedding This Year? ENTERTAINMENT WEEKLY: She said yes!! But almost immediately, Castle and Beckett learned they were going to have to spend time apart. I thought that was a bold move but I also liked how the premiere had a nice balance of keeping them apart and together. How hard did you work at achieving that? ANDREW MARLOWE: We work hard on all of our shows. [Laughs] But it was something we thought would really add to the flavor and the drama and complicate the relationship. It forced the couple to ask themselves where they were and give them something to grapple with, and it felt like a lot of fun. I feel like the interesting thing is not the acceptance of the marriage proposal and now we’re together and everything’s beautiful. It was about the acceptance of the marriage proposal and now we know where we want to go in life but life is going to hand us some complications that we have to navigate. We left with a great cliffhanger. Once that resolves, what does the balance of Beckett in D.C./Beckett with Castle look like? It’s a lot of fun. We find new interesting and challenging ways to play with it. It’s a lot of fun. It gives us back that sense of yearning and trying to make stuff work. They have to ask, ‘How do we arrange our futures so that everything aligns?’ That’s assuming Castle survives episode 2. Lisa Edelstein was great in the premiere. But her character does NOT like Castle. Will she come around? Will he win her over? I’m not sure that he’ll fully win her over. I think that after a while she will certainly respect what he does and what he can add to stuff. Lisa was on another show for a number of seasons where there was an immature manchild and [her character] never quite accepted that part of it but she accepted that what he did was very valuable. Wait, were you a House fan?! I liked House a great deal. It was a very fun show and I thought Hugh Laurie brought great complexity to a main character who you both loved and had a hard time with at the same time. Speaking of hard times, Beckett didn’t have the easiest time adjusting to the ways of the FBI. It was fun to see her as a little bit of a fish out of water in certain ways. Will it get easier for her? 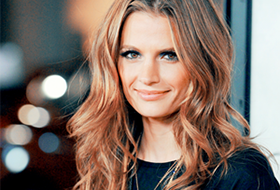 Her as a newbie really gave Stana [Katic] something to play and push against. We’ve seen Beckett be extremely confident and the tip of the spear and the best of the best and now we’re putting her in a situation where there are people who are as good or better than her. And she’s got to find her way. When we come into this, she wants to have it all but she’s not doing any of it well, which, I think, is something that not just any modern woman but any modern person can identify with. How do you balance career and family? When you make the sacrifice for family and career, how does that affect the ones you love. When you dive into your career, how does that affect your personal life? A lot of people out there are working harder than ever just to maintain a competitive edge in a very complicated job market. And they’re doing it at he cost of their personal life, and we thought it’d be interesting to see the Beckett version of that. She wants to be great; she’s not great yet. She wants to be great with Castle; they’re not great yet. And despite best intentions and what everyone wants, it’s hard. And I think that’s something everybody in the audience recognizes when they’re trying to balance all the various aspects of their life. What can you tell me about Joshua Bitton’s character, Sully, now that we know Beckett accepts Castle’s proposal? 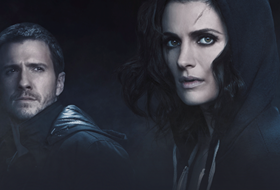 Does he take Beckett’s place at the precinct? There will be a case that takes place in New York that requires federal involvement, and our guys are investigating when Beckett and McCord will show up and take over the case. But one of the things Beckett will learn, of course, is that there is somebody else at her desk. She’s moved on so somebody has filled that role. It’s fun to see her having to react to other people, by necessity, moving on. How is Alexis going to deal with the engagement? We didn’t get to see that on screen. I think it’s no coincidence that in the aftermath of her dad getting engaged that she shows up with some boy from Costa Rica who’s hanging out. I think that part of her trajectory in the next few episodes is going to be a slow unfolding of us realizing her behavior is part of how she’s reacting to this. And in typical Castle fashion, we don’t have a big confrontation scene, but we have a lot of behavior that points towards honest moments to come. Will there be a wedding this year? I do not know if there will be a wedding this year. Actually, I know. I know if there will be a wedding this year. [Laughs] But Castle and Beckett will be dealing with that and dealing with taking those next steps. When they want to do it, how they want to do it, what the perfect wedding looks like for Castle, what the perfect wedding looks like for Beckett. I think for the initial episodes, fans can expect that they’re trying to settle into their engagement. And some of those questions will start raising their heads as we go along into the fall. But I’m not going to say if there’s a wedding this year or not. That’s a Watch and See.